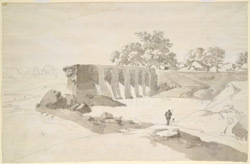 Pencil and wash drawing of a ruined bridge near Varanasi in Uttar Pradesh by Thomas (1749-1840) and William (1769-1837) Daniell, 13 December 1789. Inscribed on the back in pencil is: 'Near Benares'; in ink: '9'. This view shows the Puran Pul, the ruined Mughal bridge over the river Barna on the road from Varanasi north past Sarnath. The bridge was further dismantled by Jonathan Duncan and its material used to build a new bridge farther down river.